Did World War One and British government propaganda affect the culture of publishing during the War? The aim of my investigation is to decide whether World War One affected the culture of publishing. I will be concentrating on how the government affected publishing by monopolising the publishing industry with propaganda against the enemy during the war years. The government would use commercial companies to cover up atrocities and to promote the image of war that they wanted. By doing this the culture of published may have changed because all of a sudden publishing companies are doing things differently, and perhaps against their will. Not only would this have affected publishers, the general publics buying would have altered because they would be getting biased books and views. However, people might not have realised this due to the fact there was no television and radio, so all the government had to do was censor the written word, and to prevent soldiers from revealing what went on. 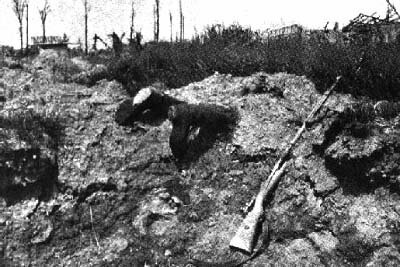 World War One occurred between 1914 and 1918 between the Central Powers of Germany, Austria-Hungary and allies, against the Triple Entente of Britain and the British Empire, France, Russia, and allies such as the USA which entered in 1917. The War was a great tragedy and waste of lives, taking an estimated 10 million, and leaving 20 million wounded. It started on the 28th June when the heir to the throne of Austria was assassinated in Serbia. In anger, Austria declared war on Serbia. In response Russia retaliated, giving Germany the chance to declare War on Russia, in protection of its close neighbour, and France. They took Belgium whilst invading France. Britain got involved on the 4th August, the day War was declared. Propaganda is the process of altering the way people think and feel about society. It affects how they look at values and priorities. It covers up what is basically ugly, repulsive, immoral or otherwise unacceptable and showing it as attractive and acceptable. This method is probably used the most in war, as it has the ability to deceive and make things acceptable to the public. There is also the suppression of material, such as the war photographs I write about later. It is also a way of promoting something which will be easily accepted by the general public because it is easy to understand, and uses reliable sources, such as the government use of publishers as I describe in the WPB section. Book publishing was effected by the War to a certain extent. There was paper rationing at a time when there was a great demand for light reading from the armed forces. The sales of books increased greatly during the war, causing books to have poor quality bonding and paper. These books would have been a major problem after the war because the quality of books returned to pre-war standard after. The publishing would have found it hard to sell them. Employees of the publishing industry also themselves found affected - it was not until 4 months from the end of the war that they were allowed not to take part in compulsory national service. Writers were also affected by the war, especially from those that fought or saw the events. Rupert Brooke saw the beginning of the war; Sassoon and Gurney saw the anger that built and the feeling of waste. Rosenberg, Owen and Blunden all saw the war first hand, being in the trenches. Soon after the outbreak of War, the British government discovered that Germany had a Propaganda Agency. Realising what an effect this could have on the War, the British Government assigned the Chancellor of the Exchequer at the time, David Lloyd George to set up an equivalent. The British War Propaganda Bureau (WPB) was formed, with Charles Masterman appointed as the head of the WPB. However some writers and publishers were very much against the idea, as J.M Dent recollects in his book, The Memoirs of JM Dent, 'I cannot say my heart leapt up as I thought of my country's stand for righteousness'. Stanley Unwin records in one of his books The Truth about a Publisher 'So great was the war-time prejudice on the subject that many booksellers refused to stock or handle it'. So even though the published pieces would be helping Britain's cause publishers and writers still showed a degree of character and sense of morals. During the course of the war 1160 pamphlets were published, many bringing propaganda to a new level. An early pamphlet, Report on Alleged German Outrages, written during 1915, said that the Germans had systematically tortured Belgium civilians. To make the pamphlet more believable, the famous Dutch artist Louis Raemaker was asked to make some drawings that would create high emotion among the British public. The artist never actually went to Belgium. Charles Masterman decided that to keep people up to date with events he would start a publication. He published a magazine, of which 24 were produced during the War years. His choice to be in charge of the magazine was John Buchan, who conveniently had his own publishing company, Thomas Nelson. The magazine was called Nelson's History of the War and the first issue was printed and distributed in February 1915. Buchan got his information through the army, where he was given the rank of Second Lieutenant in the Intelligence Corps. This also provided him with material for his book. The government saw the appointment of Buchan as ideal because he had close relationships with Britain's military leaders, and would therefore be very unlikely to write anything critical against the British fight. The government allowed many authors and artists to write on and draw about the war. In sharp contrast, two army officers were allowed to take pictures of the Western Front. 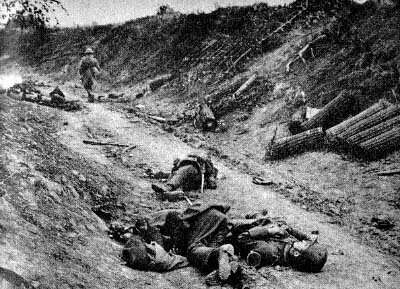 The Western Front was where the Germans had been pushed back to the Aisne River after nearly taking Paris, and were then involved in a trench warfare. The government warned that if anyone else were found to be taking photographs they would face the firing squad. The idea of photos was to help Britain portray the effort of brave and successful soldiers, which would encourage other men to join the public and to keep the publics' morale high. Having many people taking photographs would have increased the chance of unwanted photographs being published in Britain. Although there was the risk of taking photographs, others did, of which I have examples later. Many show the atrocities and waste of life. "I am not allowed to put dead men into my pictures because apparently they don't exist." "I am no longer an artist. I am a messenger who will bring back word from the men who are fighting to those who want the war to go on for ever. Feeble, inarticulate will be my message,"
Nevinson sometimes refused to bow to the government's propaganda regime and in some cases his paintings, such as Paths of Glory, were deemed unacceptable and were not put on show until after Armistice. The governments propaganda system prevented his paintings being shown, but I believe this was for the good of the country and the fight for victory. "As the intention of General Routine Order No.1137 appears in some cases to be misunderstood, it is notified that no Officer or soldier (or other person subject to Military law) is permitted to be in possession of a camera". As Ruggenberg notes, at the Imperial War Museum there are 5 million photographs of the War of which none tend to say that many people died in the same place. I have been given permission to show the following pictures, which were not allowed to be published during the War as this would have had an effect on the publics' morale and would have started to ask questions. Argonne. 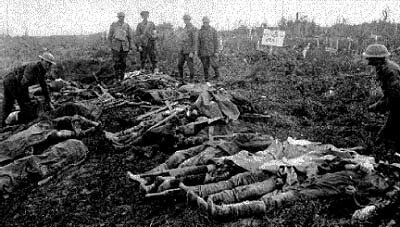 This shows many dead French soldiers in the Argonne wood, something that was not supposed to happen in large numbers. Austrian's. 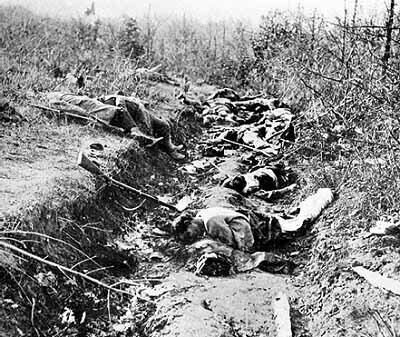 The Austrian trench on the Serb front reveals that whatever images were portrayed, many lives were wasted. Cemetery. A French war cemetery near Verdun again showing the deaths that did not occur. Revealing the deaths would have stopped people volunteering. Gathering. 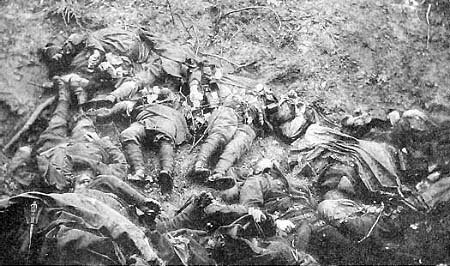 The soldiers are gathering corpses of their dead comrades to bury them, which would have lowered morale if seen. Legs. 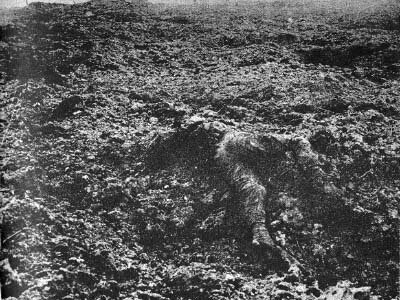 The photo shows a soldier with just his legs remaining. Such as image would have made people think twice about wanting to continue the War. Mud. A dead body covered in mud near Passendale, left to rot with no burial - would you want your son to come to this would have occurred to many parents? Tree. 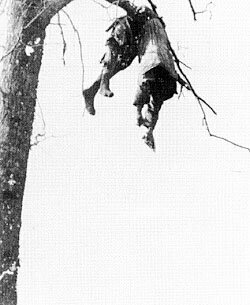 Simply showing a corpse hanging in a tree, again ask the question above. Russian. 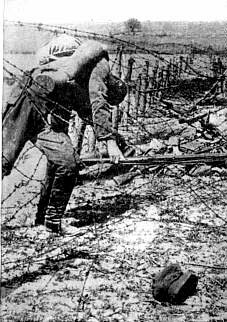 A picture of a Russian soldier who died on barbed wire. Although a German picture, the German government still used propaganda to cover these types of pictures up. Spy. 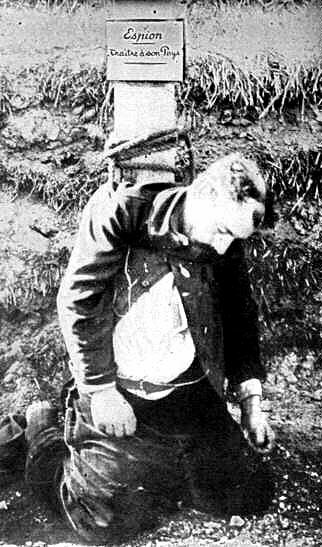 This shows German spy who has been shot by a French soldier. Potential soldiers might have seen his and thought 'I can not do that'. The government did not want to stop believing they could help their country, and this would have cause doubts in many people. Skeleton. 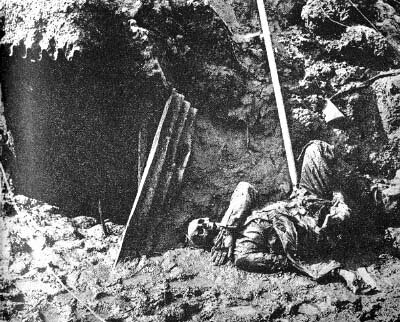 A skeleton near a destroyed dugout at Beaumont Hamel showing that the War had no feelings, something the public probably knew, but could not relate to without pictures. Walk away. 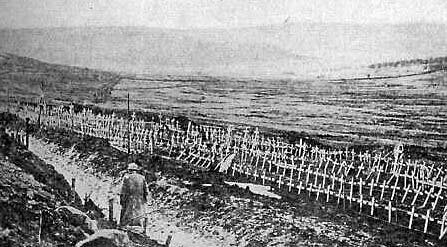 A trench near Dury in France showing a group of dead bodies. A picture like this would have asked people whether they wanted to join up just to see their new comrades killed, and that all they could do was walk away. i. White Leaflets - These are generally linked to a reliable source, although they might not contain true information. The link might be to a Prime Minister or president. ii. Grey Leaflets - These do not have a known source, but the idea of them is generally known. They are a cross between white leaflets and black leaflets. iii. Black Leaflets - These leaflets are all false information. The source of the information is false, as well as the information itself. An example of this was when the Allies dropped leaflets in Germany saying that there were anti-nazi groups in Germany, which were actually non-existent.
" FOR WHAT ARE YOU FIGHTING, MICHEL? They tell you that you are fighting for the Fatherland. Have you ever thought why you are fighting? An army of ten million is being prepared; soon it will come into battle. Have you though of that, Michel?" The Poster had a major part in the war. They were responsible for recruiting soldiers, by showing men as a protective force. They would show comradeship, which of course there was, but no reference to death and loss was shown. Posters would show the enemy in distorted images, showing people as devils for example. Posters were popular during the War because they were a relatively new medium, and one that appealed to the public. Posters would generally use images such as victims of war, orphans, soldiers, starvation and national symbols, such as the British Bulldog. These posters could change people's opinion of the Germans, even if it was a false impression. They were printed in large number, usually 25000 or sometimes an amazing 100000 would be printed. They were immediate in impact, and could be put up anywhere. � and the crucifixion of captured soldiers. To me there is no doubt that the World War One and propaganda did affect the culture of publishing. Due to the government's influence, people were buying books, reading newspapers, and looking at paintings and pictures without a thought that they were being misled. The publishing companies would have changed too because all of a sudden they had someone else telling them what to do. Without the government controlling propaganda, the British public would have known what was really happening, which would of lowered morale and made people not so willing to join up. Without the propaganda we might not have had the armed forces we did, so although the publishing industry went through years of change, and maybe it wasn't for the good of publishing, I believe it was needed to win the War. The War affected publishing directly by limiting paper usage and the way in which the government controlled public writings and pictures. Publishers also became an industry that was dominated by the War.